Seasonal snow accumulation started early, and was considerably above normal by the end of November, as illustrated in a post last month. This pattern has continued through December, with 76 cm of net accumulation for the month, and snowfall to date for 2013-14 continues to be the highest of our period of record (since 2004). On January first, snow depth at the station reached 1.5 meters, twice the average for this date! Despite all the snow this season, note how little snowcover blankets the landscape on the 29 December Landsat 8 image below. 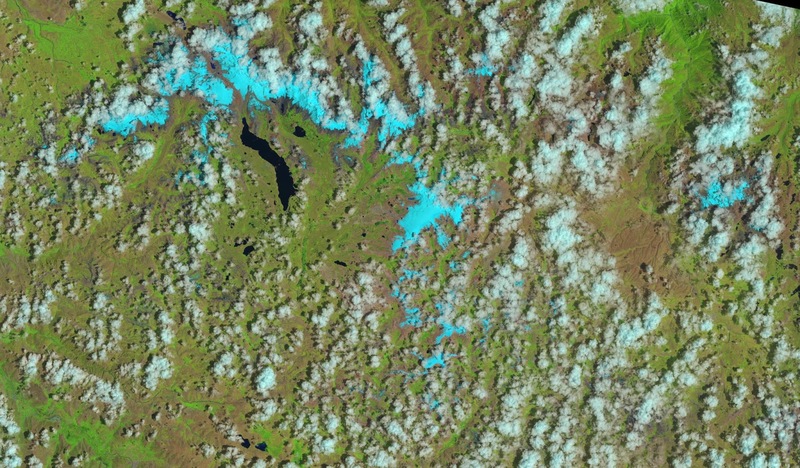 This cropped scene is essentially the same as that posted earlier, for 26 October and 11 November, revealing almost no snow below ~5,200 m. However, the impact of this precipitation on vegetation is discernible as more-intense shades of green. Snowfall this season has resulted in weak transmissions to the GOES satellite, and only ~11 percent of data from the station was received by telemetry during December. Rime formation on the antenna may also be degrading the signal, something our timelapse camera is hopefully documenting. Fortunately, all measurements are stored on-site and will be recovered during 2014 fieldwork.